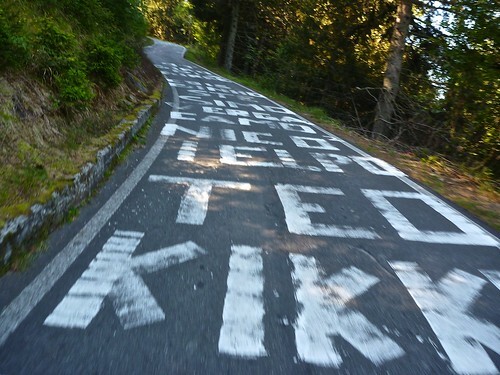 One of the steepest climbs regularly raced up – appearing 10 times in the Giro since 1990 – always from this side starting in Mazzo. It’s a funny climb. 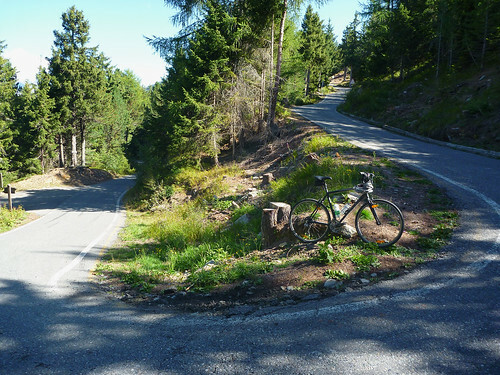 A tiny single lane road that climbs relentlessly past 32 signed hairpins, mainly in the woods. 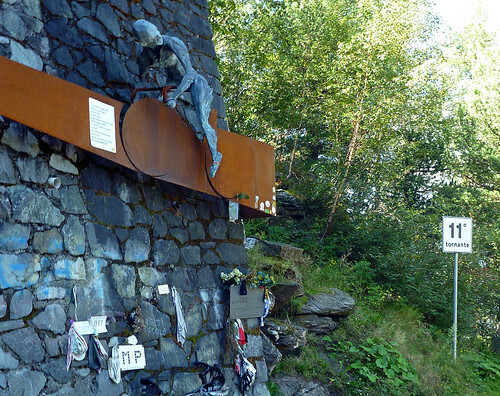 At hairpin #11 (#1 is at the top) is a monument to Marco Pantani. Apparently the tradition is to leave your old bandanas here. I descended back the way I came but turned off to descend to Grosio. This route is easier (but still challenging) and , in fact, a lot more scenic. The higher parts along a pretty ridge road with mountain and valley views. Steep! And fun. 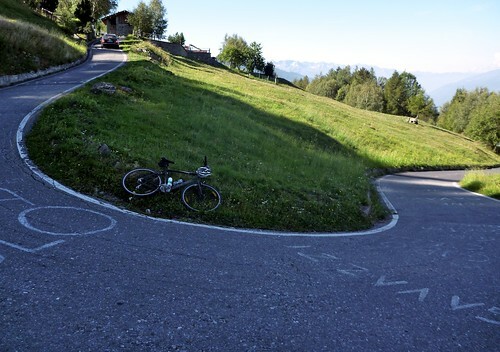 But no where near as interesting as its neighbours Gavia and Stelvio. I rode this one in 2008 and found it to be an absolute brut! It was really tough in 39×25. I am glad that I completed it as you guys suggested (1:17 min) but probably wouldn’t do it again unless I had a compact or was stupid enough to be feeling that mad at the rest of the world. LOL. I agree that the Stelvio is much prettier. I took the easy route up (I believe the south side) It is really a very easy climb and oh so scenic. I expect I’ll do La Gavia next year. I must confess that I have officially chickened out and am now using a compact. I have been enjoying your site and stories. I will be heading to Italy in Sept 2014, I wiil be staying in Bornio. 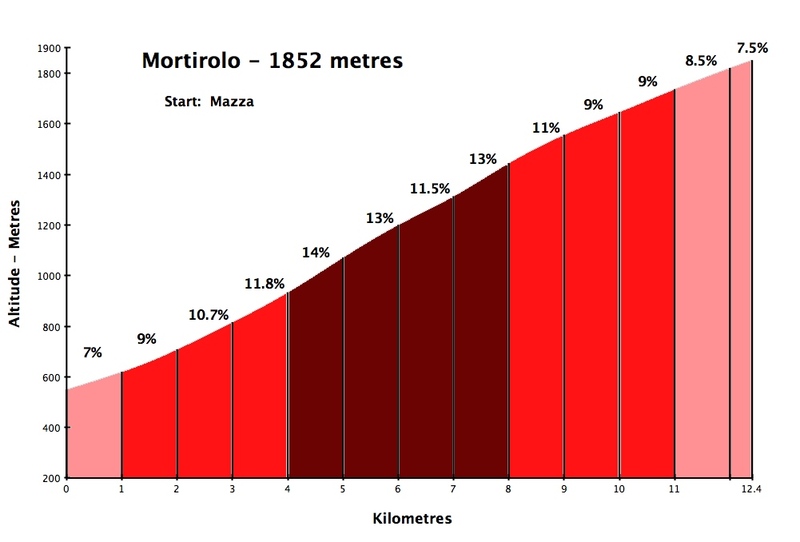 While there I plan to climb the Stelvio, Mortirolo and the Gavia. Your site has given me all the information and inspiration I need . I hope to contact you on my return home with news of my success on all 3. While I am away I am also climbing the Blockhaus and the Passo de Leonardo (Near Pescara). 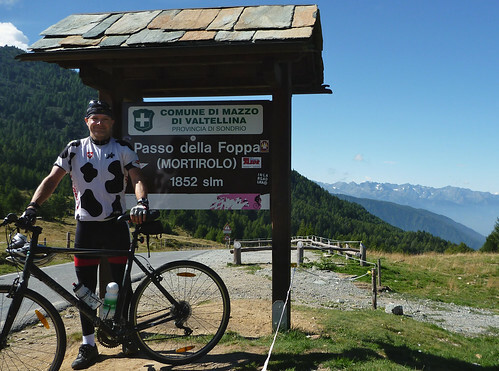 Whether you (or anybody) will cycle Mortirolo, take tiny road to Col Carette di Val Bighira. It starts just above restaurant near the top from south. There is only steep first wooded km, then you are going through meadows with great vieuws to Ortler. 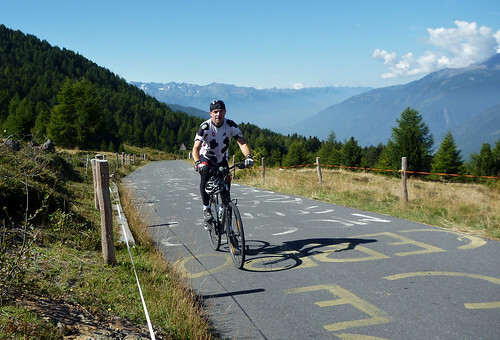 Summit is in 2130 m high and road is full surfaced. From opposite side is tarmac only for 2 km or so. 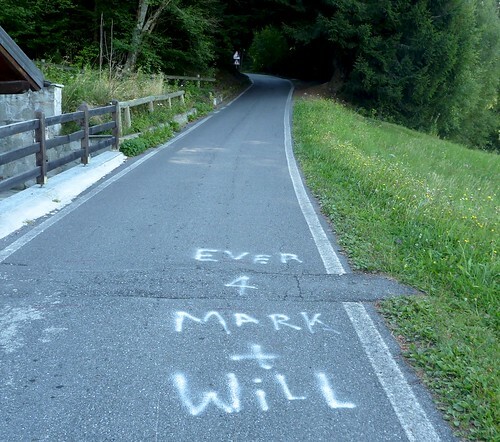 Another (girl’s) variant to Mortirolo leads from Aprica via Trivigno. I never went this way, but some people from our group yes, and they discovered pleasant ridge road with good vieuws.